Because there has to be a cat page, doesn’t there? Spook–my mother’s cat. She got her name from her habit of hiding behind furniture and pouncing on passing feet. Her favorite toy was a piece of paper folded accordion-style and tied in the middle with a string–she would determinedly chase, catch and shred them. 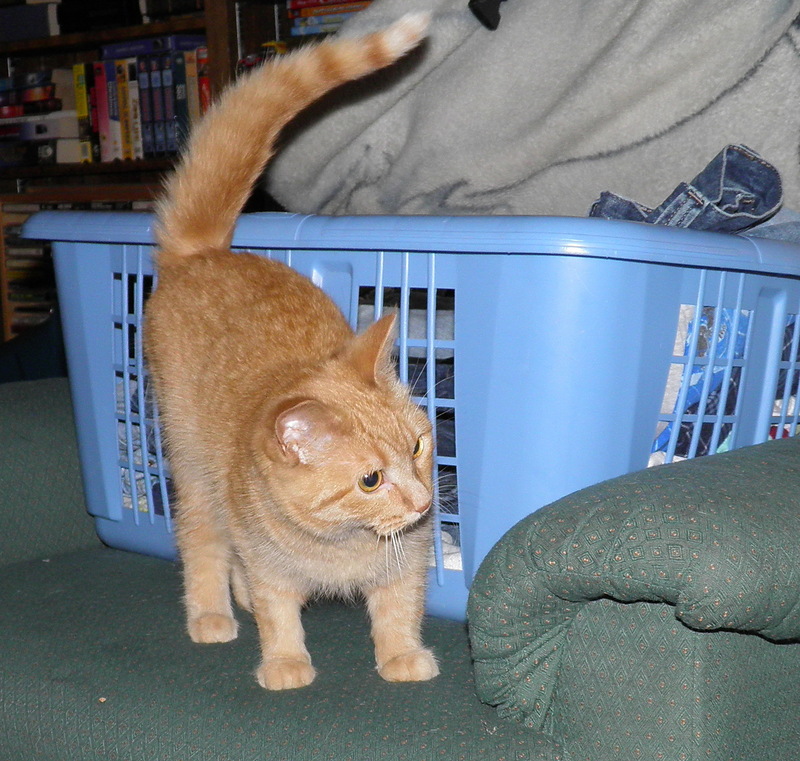 Scamper–my older sister’s cat. 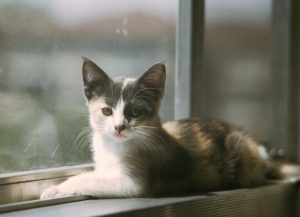 Small, skittish, and conflict-adverse, she earned her name darting through the back alleys and shadowed corners of our house. She stayed behind when Sue moved to San Diego in 1975, eventually becoming the matriarch of my mother’s house. A letter to the editor, published in the Camden Courier-Post. Short stories published in Impressions, the student newspaper at St. Joe’s High. creative writing class I’ve ever taken. Charlie–Karla and I adopted him as an adult cat from the Ingham County Humane Society. He was an adrenalin junkie and aerialist–he loved to be tossed on a blanket, or dropped off the Briarwood balcony onto the living room couch. Resumes and cover letters. Sturgis MI Charlie Lesson plans for my science and math students at Heritage Middle School. Goshen IN Charlie More lesson plans. 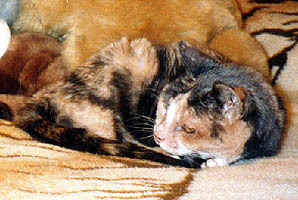 Arro – Gwen’s calico tripod, and the haughty grande dame of her household for more than 27 years. They moved in with me in June, 1988, and we finally said good-bye to her in May, 1994. 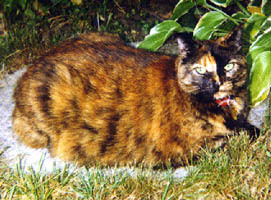 We have many Arro stories, because she was a cat of great character, with both endearing and annoying quirks. 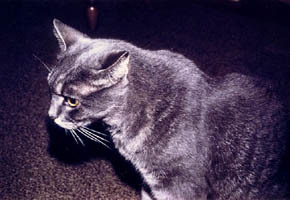 Shadow – Gwen adopted Shadow as a young adult while she was living in Louisville, and he came to Michigan with her in 1986. He was leonine in face and bearing, and entered a room as though he owned it. 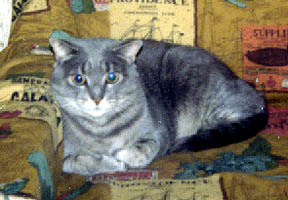 Dr. Levi Gray – the runt of a litter born at Gwen’s sister’s house in Georgia. Doc and his Russian Blue genes were originally destined for Gwen’s parents’ house, but Shadow had begun bullying the aging Arro. 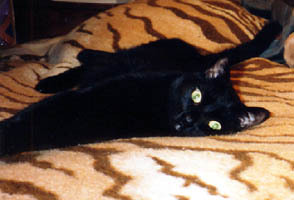 So we worked a trade in October 1988–Shadow got to be King Cat at the Zaks’, and gentle, plush Doc came to live with us. He was ever a lover, not a fighter, and a favorite of young Amanda. Doc passed away in April, 2003. Meridian Twp. MI Captain loved the new neighborhood, with voles and the occasional rabbit in our fenced and usually overgrown back yard. 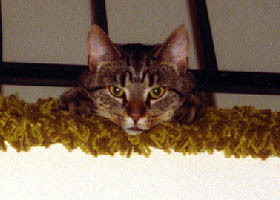 But a mysterious neurological affliction took him from us in July, 2001. 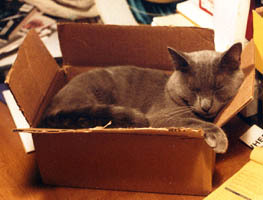 Phoenix – a shelter rescue, adopted as a four-year-old in August, 2001. We suspect her previous owner punished her for asking for attention; it took a while before she started to allow more than a tummy or cheek scritch every so often. But she became the most aggressively social of our cats – the most likely to talk to us, and to invite herself onto laps and beds. Much of the transformation happened when Matt came home from college for that Yule–because for whatever reason, Phoenix just loved him. 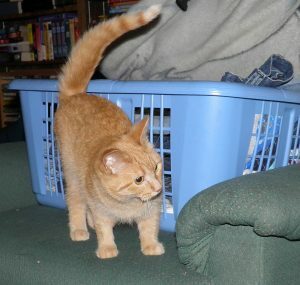 Gryffin – a medical rescue, adopted in August, 2001. Gwen had a dream about a yellow cat, and the next day spotted Gryffin at a local pet shop. But because of a major heart murmur, he was likely to be discarded. We decided to roll the dice on his health (and his aggressive biting), and our faith was rewarded. Gavin became his primary human–he could pick him up and not pay in blood before anyone else–but the neighborhood was Gryffin’s world. He made friends next door, across the street, and down at the corner. We often didn’t see him for days at a time, even in winter. 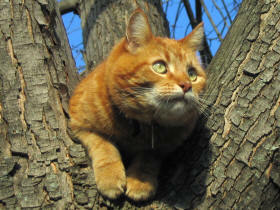 Gryffin fell ill in 2012 and left us that November. Miss Bob – one of two guest cats who moved in along with a friend in the fall of 2003. Bob (yes, she’s a girl, named after the planet) looked to Gryffin as her role model, but she can’t quite get it right. She’s much more of a homebody, much more nervous, and kind of a klutz. Like Gryffin, she loves the rooftop. 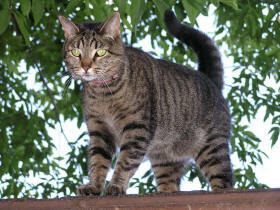 As our huntress, she brings us presents–dead birds and field mice, live birds and field mice. She became a permanent member of the household when our friend went home to Pennsylvania. 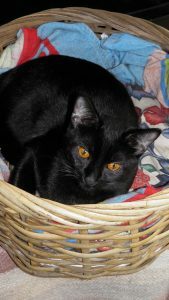 Celeste – adopted April 2011 from the Ingham County Animal Shelter. Celeste was the smallest cat in the shelter at the time, hiding in the back of a cat cubby. Amanda fell for her at once, and we expect Celeste will presently accompany Amanda into her adult life. In the meantime, she is queen of the basement during the day, joining us upstairs in the evenings. She would spend more time upstairs if the dogs weren’t so eagerly curious about her when she appears.